This project quickly grew from a simple remote controlled camera and transmitter project we planned to install late 2002, into a much larger project with multiple cameras, VCR, ATV receiver, auxiliary inputs and outputs, and more that we hope to install before long. Except for several photos, a lot of the construction was done before it was realized and more photos were taken. This page has been quickly put together and somewhat incomplete but I will try to keep it updated from now on as the project progresses. System Monitoring - of all voltages, RF output and reflected power, and other system parameters. Numerous operating features - too numerous to list and constantly changing as ideas develop. This project started out simple enough. 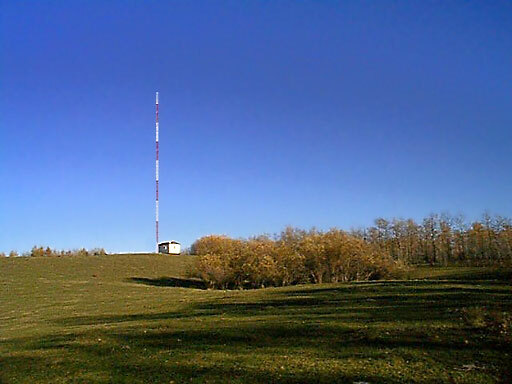 Use DTMF tones, over UHF radio, to control a video camera, pan-tilt head and a 23 cm FM ATV transmitter to transmit video over a 26 mile (42 Km) path from Barry, VA6DX's acreage near Miquelon Lake to his home in Sherwood Park. While waiting for ATV equipment, we did a path test with 1W 23 cm handheld radios and beam antennas from the top of Barry's 170' acreage tower to the top of my 56' tower. 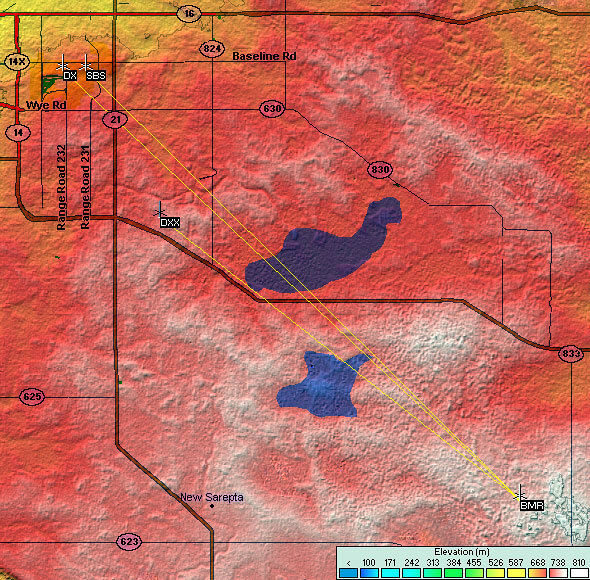 The test was successful even though a hill blocked a line of sight path. With no way to measure the received signal strength and with wide bandwidth ATV requiring more signal than narrowband voice communication, we could only hope that the path would work as well for ATV. site if all else fails. has 2 obstructions of 3.12 meters and 1.23 meters (10.24 ft and 4 ft). has 1 obstruction of 5.46 meters (17.9 ft). Even with obstructions Barry and I are predicted to have enough signal for P5 reception 96% of the time. is an excellent line-of-sight path. Barry wanted to install the 23 cm ATV antenna at the acreage before winter weather arrived. A signal to align the antenna to would be helpful so with clip leads, adapters and a few feed line extensions, I quickly connected some equipment together to get about 8W of RF up to my small 23 cm antenna to transmit a color bar signal in roughly the direction of the acreage. This signal would also give us a chance to see how well this path was for ATV, once the antenna was installed at the acreage. Conditions were less than ideal so the signal could be improved if this first test proved less then ideal. Transmit power was 1/2 and the gain of my little transmit antenna was 1/2 of what would be used later at the acreage. The trees along the path were also full of with rain soaked leaves. I hoped for at least a 1/4 scale "S" meter reading at the acreage antenna when it was installed, but Barry had trouble getting any indication. He had a good idea of the direction to aim the antenna so had to resort to that. By the time Barry got off the tower it was dark. With no clear signal indication at the antenna, there was little chance that we were going to see now after 170' of 7/8" feed line. We could only hope as the receiver was connected to the feed line, but as expected, no "S" meter indication. There was no need to waste more time and connect the video monitor to the receiver, but we figured we may as well since we were already there. Besides, we didn't believe things could be as bad as they appeared or know what to do next if they were. I hoped to see at least a hint of received video, but to our surprise we see beautiful P4.9 color bars. Based on this, the path should be usable for P5 operation when higher power and the higher gain transmit antenna is used. See Barry's Web Site for additional pictures of his acreage and tower. Design and construction of the Remote Controlled ATV Station was started in August, 2002. 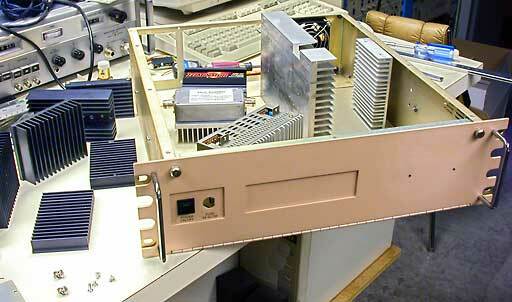 A 5¼" high rack mount enclosure was found with an existing fan that would save some work to install one. Work began by removing the existing enclosure equipment and replacing the 120 VAC fan with a 12 VDC one. Next (see photo) heat sinks were selected for the 23cm 20 watt PA and PA power supply and their placement was planned for the best air flow. Heat sinks were chosen that could extend the enclosure height when the fins were run horizontal. 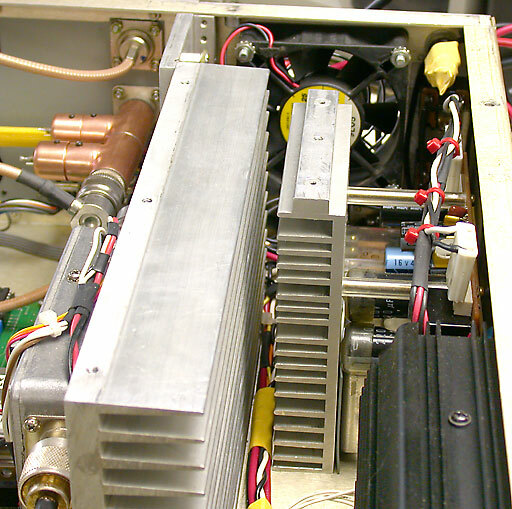 The large heat sink, from previous photo, was cut down in height to fit the chassis and used to replace the smaller one supplied with the 23 cm PA. 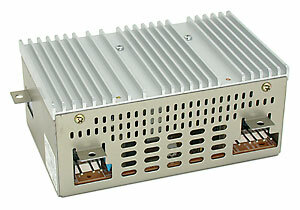 This 120 VAC input, 12 VDC output, switching power supply was rescued from a discarded 3/4" commercial VCR and modified to supply 14 VDC for the 23cm PA. After testing, to ensure that it was capable of supplying 5 amps continuous, it was fitted to a different heat sink for installation purposes. the larger heat sink on the left. to the smaller center heat sink. With the top panel in place, fan air is contained within the channel formed by the large PA heat sink and forced to flow over it and past the PA power supply and heat sink. 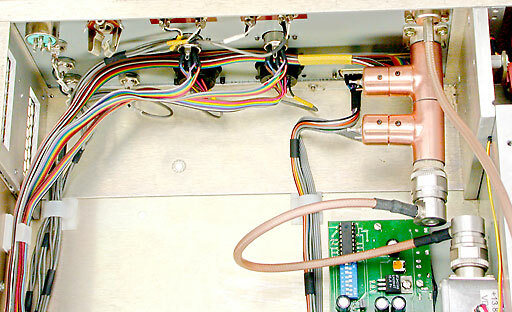 The air then flows past the AC Inverter and over the 13.8 VDC switching power supply used for AC operation as it changes direction to pass over the controller electronics. The air finally flows past the 23 cm exciter and 13 cm receiver on it's path to the rear exit vent. Cooling air is normally passed over major heat producing components last. However this unit will be located in an unheated building and cold winter temperatures are more of a concern than summer heat. The idea is to make use of any warmed air to raise the controller electronics to a more reasonable temperature. Incoming air, heat sinks and the controller are temperature monitored. Fan speed is controlled to provide the optimum air flow for cooling and self heating. It is amazing how many conductors are required to connect everything (and more wiring is still required). Fortunately, space is still available to install several additional connectors for new features added. Front panel items are mounted on a sub-panel to eliminate the sight of any mounting screws on the finished front panel. Standoffs are used to obtain the required spacing for each item to sit flush with, or fit through, front panel cutouts. All mounting holes are tapped or blind nuts have been installed to eliminate loose nuts which can be difficult to install sometimes. This takes little extra time, but makes assembly easier and saves time overall. I knew this rack mount shelf that I had saved would someday be perfect for something. 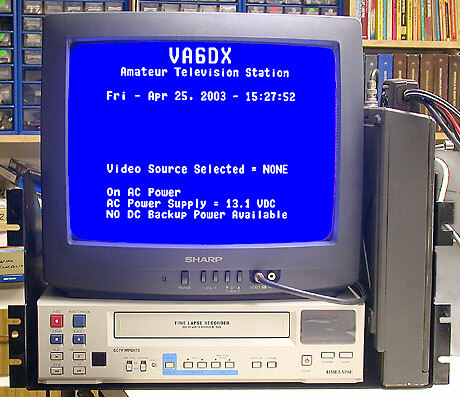 Time Lapse VCR and Monitor. The Control Radio is a UHF Mitrek to which a Speaker Volume and Squelch control was added in addition to a Channel Select switch. When we figure enough hardware has been added to satisfy our needs (for a while at least), I plan to layout and have several PC boards commercially produced. One board will be to replace the development boards in this station. 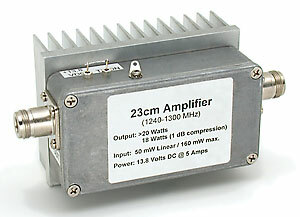 The second board is planned for a local 13 to 23 cm cross-band repeater. 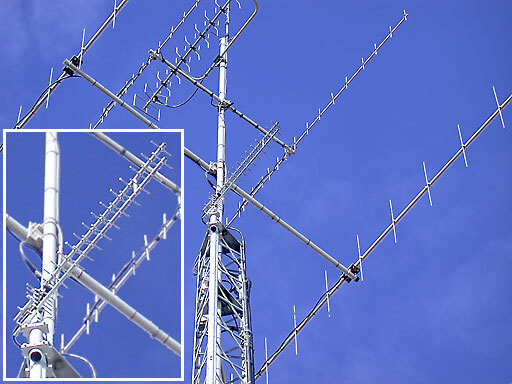 Plans for a local repeater will naturally include linking, on 13 cm, the two 23 cm stations for easy local viewing of Barry's remote station video. More information to follow as this project progresses.